Property searching is such a visual and emotional experience that it makes sense to show off what you’ve got to prospective buyers. On social media such as Twitter, where users are spending more and more of their time, simply using 140 characters just isn’t enough. 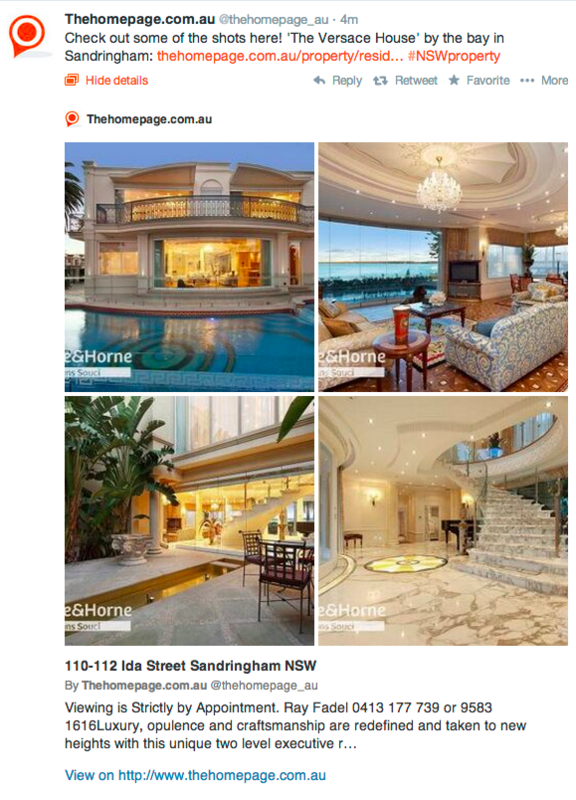 Starting today, any property tweeted from Thehomepage.com.au will now have its photography automatically pulled into, and displayed on, your followers’ Twitter stream. Using this method properties tweeted from Thehomepage.com.au will have much more emphasis in an otherwise text heavy and crowded Twitter environment. “Thehomepage.com.au is committed to providing free property listings and cutting edge technology solutions to the agents that list with us,” said Thehomepage and MillionPlus CEO Ben Stockdale. To celebrate the launch, Thehomepage.com.au is offering feature property upgrades to agents that tweet their properties from Thehomepage.com.au with the hashtag #free (until the end of May 2014). Thehomepage.com.au is a free property listing website alongside partner site MillionPlus.com.au. The portals were founded to challenge old business models by providing free standing listings using innovative technology solutions. The Guest Author of Business2.com.au can be anyone who submits an article to Business2.com.au and it gets approved by one of the Editors . Not all stories are published, however we want stories that are of interest to Real Estate Agents and Technology and related to this industry. If you would like to be a regular contributor to Business2.com.au we have an application here, or if you have a one off story you would like published, click here and we will review this story. Homely.com.au sees record visits, doubles traffic in 12 months, appoints key executive to head up growth. Computers vs Real Estate Agents – friends or foes? Homely launches national ‘Pay-My-Rent’ campaign, allowing Australians the chance to live rent free! Homely concludes a successful year with biggest bang yet. Excellent… but technically this isn’t an Australian first. Whilst they do not have the scale of thehomepage, aushomesforsale.com.au have been doing it for some time: @AusHomes4Sale https://twitter.com/AusHomes4Sale – It is a private sales site but they also re-tweet listings for agents. I can’t see that AusHomes has implemented the technology to automatically bring the photography into the Twitter feed. Twitter will automatically bring in the photo’s for any tweet that contains a link to one of our property pages. Try it out with one of our properties and see for yourself.